Zapier provides an easy way to integrate hundreds of web services, allowing you to pass data between your favourite applications without ever having to write a single line of code. Creating a ‘Zap’ is all based around triggers and actions which is basically a way of automatically linking things so that when something happens in one app it can do something else in another app. The starting point is to create a Zap that triggers when a new contact is added into Salesforce – when that happens, all the user details can be sent automatically into Instiller and you could link that to trigger a Workflow which would add that person to one or more lists, send them a series of emails over a timed period or send them on a completely customised user journey – it’s that simple! 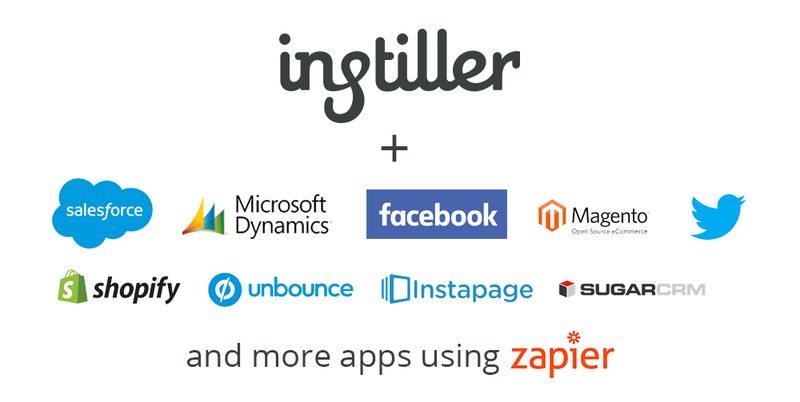 There’s two Instiller Zapier apps and both are currently invite only. Head on over to Zapier and create an account then click on one of the invite links below to add Instiller to your dashboard. For now, our Zapier apps are invite only so you won’t be able to find them through searching on the Zapier website – use the links below to get started. This is just what’s available in our first version and soon you’ll also be able to receive alerts when sending and click tracking domain DNS issues are detected and when IP addresses or domains get blacklisted. You can set up and manage Zaps up on behalf of your clients or they can go right ahead and do it all themselves. It’s easy to do and remember, there’s no coding required! With hundreds of apps to choose from and a range of triggers and actions that we’ve developed the possibilities are almost limitless – especially when you bring Multi-step Zaps in to play. In this first version of our app there’s 4 triggers and 4 actions. We’ll be adding more later but for now this little lot will provide you with everything you need to connect your favourite apps to Instiller and back again. Need to connect multiple apps? Not a problem with Multi-step Zaps because now you’re no longer limited to only two steps and you can set things up to trigger actions in as many apps as you like. If you like the sound of our integration with Zapier and have any questions then just let us know.